Rushden Lakes retail park in Northamptonshire is marketed as a new era in out-of-town shopping. It is built next to the Nene Valley, a large SSSI nature reserve and is linking retail with outdoor leisure and nature. Blue Mount International, a visual marketing company first approached me about this project early in 2017. 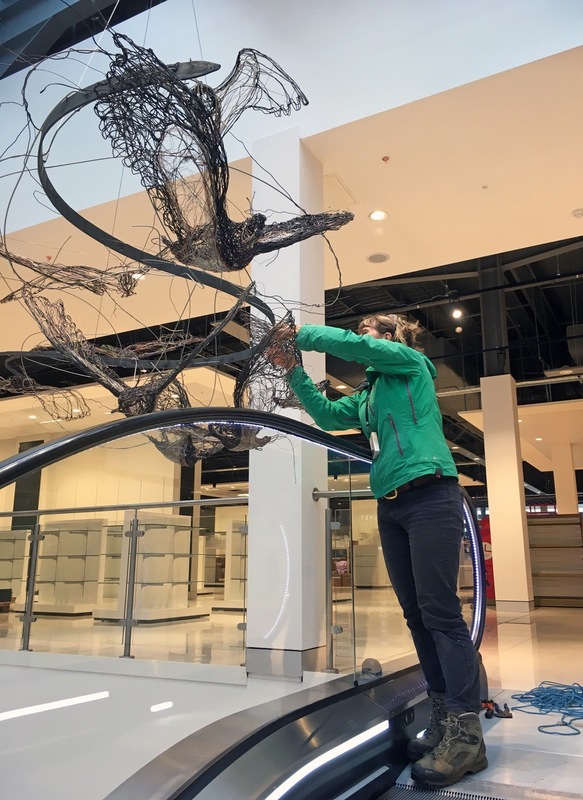 They were looking for a striking sculpture to hang in the atrium of House of Fraser’s new store that would reflect Rushden Lakes ecological ethos. The Wildlife Trust of Bedfordshire, Cambridgeshire and Northamptonshire manages the nature reserve and the reserve manager Ian Hilbert met me on my first visit to the site. 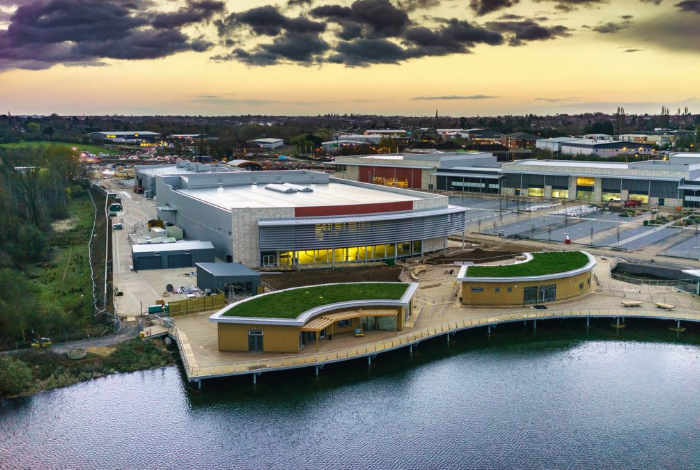 I was shown around the main lake that the retail development looks over where there are bird hides and information boards enticing visitors to find out more about the local wildlife. 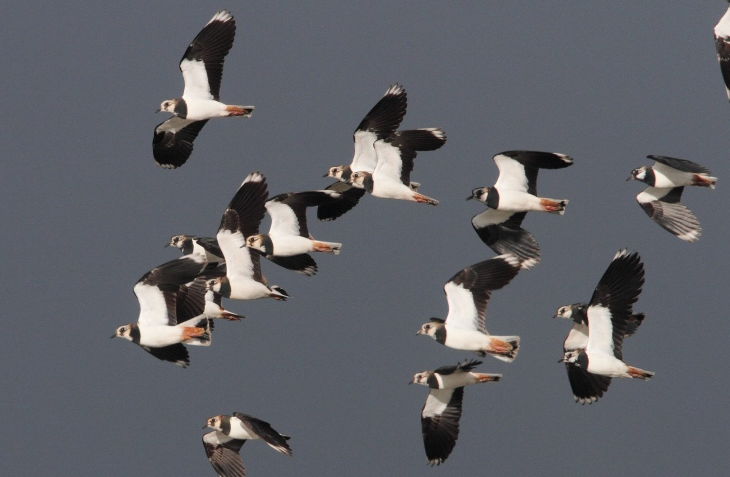 I found out that Lapwings and Golden Plovers often flock in large numbers near the retail park and so I decided to focus on these birds for proposed my installation. On that same visit I also got to see the inside of the House of Fraser store – at this stage it was just a shell and it was hard to imagine I could ever make a sculpture that would fill what seemed like a cavernous space! The dimensions of the space were 13 metres long by 9 metres wide. I quite quickly came up with the concept for the sculpture – I wanted the birds to be flying through the space with a feeling of movement through trailing wires. The sculpture was designed so it was split into 5 separate flocks and to adequately fill the space I decide there should be 50 birds. One of the steel ribbons. Myself and Holly made the birds, we had several days where we worked together so I could show Holly how I wanted the birds to be made, we were also deciding the types of wires we would be using. 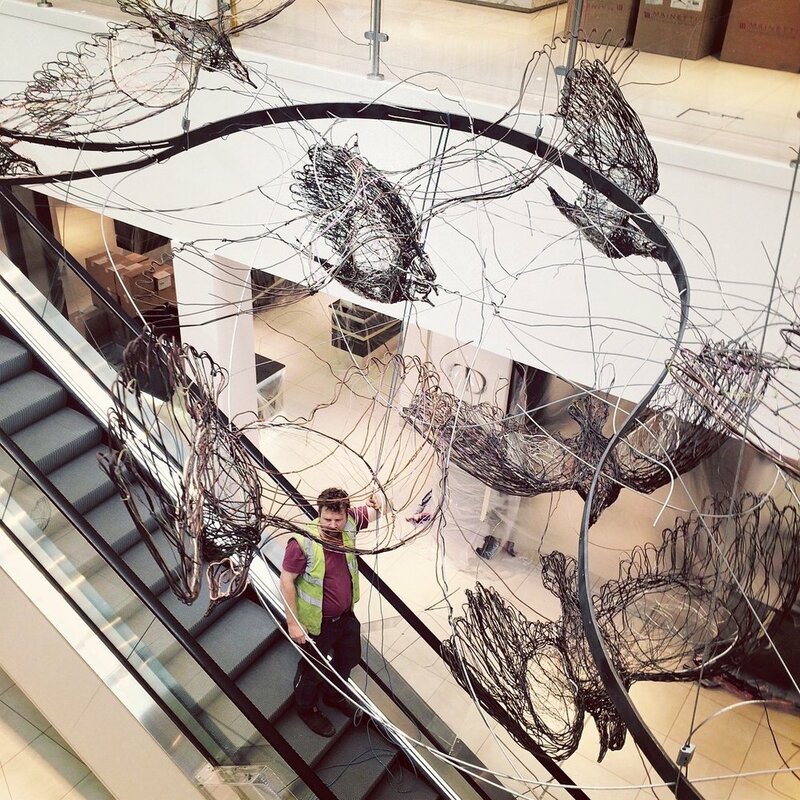 House of Fraser was very keen for much of the wire we used to be reclaimed wire. I think 50% of the wires we used was reclaimed: lacquered coppers from motor windings, plastic coated colourful telephone wire and tinned copper cabling. The Birds in the making on my studio wall. One of the main obstacles in the project was trying to work out how to hang a flock of birds within the 15 metre high glass topped atrium space. Luckily there exists a helpful company called Ecorig who supplied and fitted five permanent lifting devices that my sculpture could be raised and lowered on. Meaning that our feet never had to leave the ground when we came to installing, an important consideration due to stringent heath and safety regulations with working at height. We put together our first flock of birds at the beginning of June, this was an experiment to see if our hanging system would work and also to weigh the flock so could assure ourselves that we were working within the tolerances of the lifting devices. It was at this stage I had a sudden realisation that I needed a large space to house all the flocks as we made them! The birds within the flocks were completely suspended hanging above and below the steel ribbons – this meant that once we had woven the birds on they had to remain suspended and could not be stacked. Luckily Max is great with coming up with solutions and he offered to hang them in the roof space of his workshop.. this did involve some interesting manoeuvring on ladders and rigging but each flock was safely hung up as we made them. The next hurdle, was getting the flocks to store while staying suspended. Again Max came up with a fine solution of making wooden crates around the flocks that supported the steel ribbons and allowed the birds to hang. This did mean that they took up huge amount of space and we ended up delivering in several large vans! The birds in the crates after arriving at the store. We installed the sculpture on August 9th 2017 – it took a whole day to position them and ease them into place. It was a nerve racking day as I did not know whether the sculpture would work in the space until it was installed. Tweaking the birds before the are raised 15 metre up! Max and Hollyhelping at install. I was really please with it in the end – and thank Max and Holly for their patience and hard work in helping me make my biggest installation to date.